An interaction is much more than what each person involved says or does. 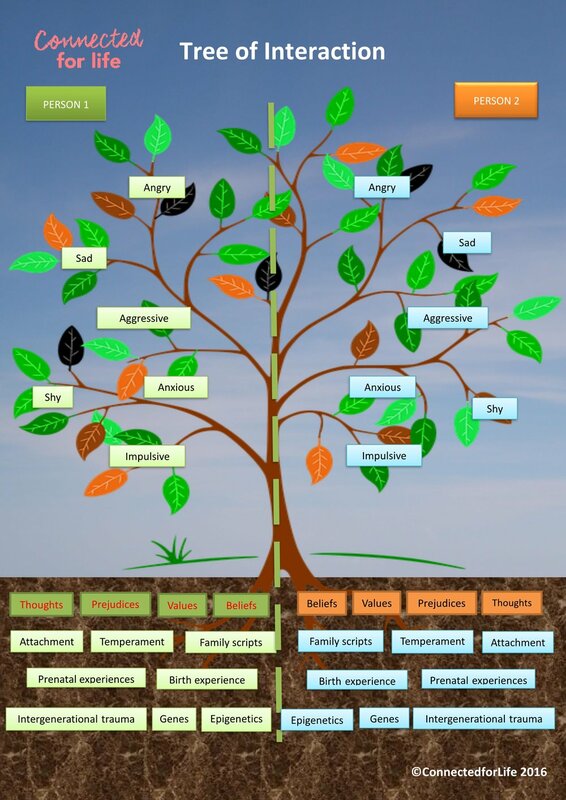 The Connected for Life Tree of Interaction shows the complex interplay of behaviours, narratives and histories that is taking place, usually without our knowledge, during every interaction, whether it is a conversation with your partner about whose turn it is to put the bins out or a one to one session with a service user about a painful subject. Most interactions involve more than two people, directly or indirectly. For simplicity, our tree represents an interaction between two people only. The left side of the tree represents what one person brings to the interaction, while the right side represents the other person. What we present to the world, our behaviours and actions, is only a small part of the story. Our behaviours and actions are determined by our thoughts, prejudices, values and beliefs. Underlying all of this, usually unconsciously, is the influence of genes, how these genes are expressed (epigenetics), temperament, prenatal, birth and early experiences, attachment experiences, intergenerational trauma and family scripts (beliefs held by or behaviour patterns within a family). A simple word / sentence uttered by a partner can trigger early attachment wounds, resulting in conflict. For example, the words “don’t be stupid” may be said in jest during a conversation. However, these words may have been used by a parent who was abusive and therefore may be experienced as hurtful, critical and a threat to the relationship. A parent may treat their child punitively and harshly because of strong, long held family beliefs about adults being powerful and children being submissive. A Social Worker who experienced neglect as a child may be quick to judge a parent who is experiencing post-natal depression and is struggling to look after their child. A manager may be more likely to ignore conflict within the team if they have developed an ‘avoidant attachment style’ at an early age. If the partner recognises his / her feelings of hurt as an early attachment trigger and shares this with his / her partner, a conversation may open up that brings increased connection and has the potential to enhance the relationship. If the parent becomes aware that for generations his / her family of origin has held the belief that adults should be powerful and children submissive, they may make a conscious decision to do things differently. They may change the belief to a new ‘corrective script’ that suggests that both adults and children deserve respect and therefore treat their child with kindness and compassion. If the Social Worker recognises their judgemental thoughts as sadness and anger about personal experiences, they may be more likely to view the parent with compassion and to provide support. If the manager becomes aware of his / her avoidant attachment style, he / she is then likely to recognise that sound management decisions must be based on the current situation rather than an intuitive tendency towards conflict avoidance. This may result in a change in management style, leading to more positive decisions for the team.